An evening of stories, histories and reflections inspired by St. Non, the mother of St. David, and the Pembrokeshire cliffs where she gave birth. All welcome! Croeso cynnes i bawb! On the last day of the Brexit process, Sustainable Wales is delighted to feature a EU-wide event. Originally from Abercynon, PC. Evans describes himself as a “citizen of nowhere”. Now based in Amsterdam, Paul will read his own poetry, written whilst living and working in that city’s Red Light district. A strong open mic will feature Gerry Ray, with poetry about his life in Spain; while Paul Woodford, will provide a Brexit film. Of course, there will also be pro-Brexit voices heard in this popular literary gathering. In 2016 the Bridgend constituency voted 54.6% to 45.4% to leave the EU. Robert Minhinnick will read poems published during his tenure as editor of the international magazine, ‘Poetry Wales’. Free copies will be presented to all who pay £4 entrance. A warm welcome to all / Croeso cynnes i bawb. For full information and menu see the dedicated page. 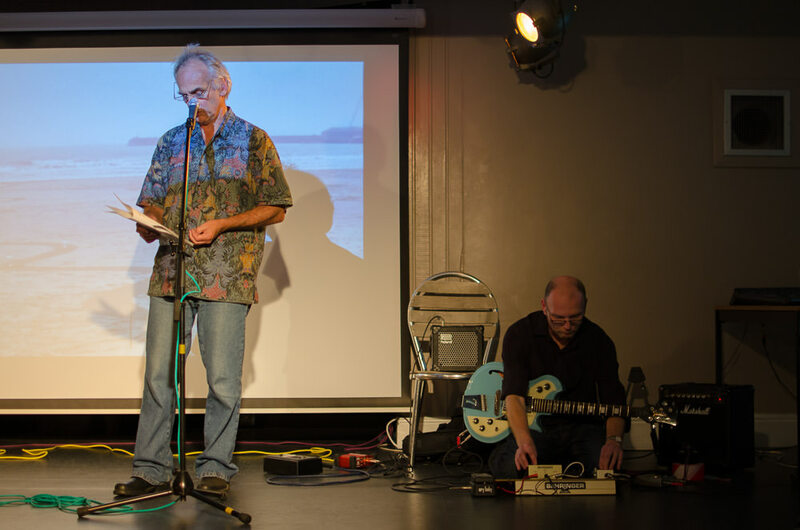 Sustainable Wales’s ‘Green Room’ returns from its winter break with a reading by poet/novelist, Chris Meredith. To be followed by an Open Mic for local writers. Chris will be reading from his recently published volume of short stories, ‘Brief Lives’ (Seren), which will be on sale. The book is described in the ‘Western Mail’ as “a moving, mature kaleidoscope of human experience”. He will also read poetry, including some Welsh language verse. Chris is the author of ‘Shifts’, available in the Seren ‘Classics’ series, available in the SUSSED bookshop. His most recent collection of poetry is ‘Air Histories’. Christopher Meredith is the award-winning author of four novels and three collections of poetry and also translates Welsh to English. Prizes include an Eric Gregory Award, the Arts Council of Wales Young Writer Prize and the Fiction Prize for his first novel, Shifts. His second novel, Griffri, was shortlisted for the Book of the Year Award. His collection of poems, The Meaning of Flight, was long-listed for The Book of the Year Award 2006. His most recent novel is The Book of Idiots (2012). He has given readings all over Britain and Europe as well as in Israel/Palestine and the USA. Born and brought up in Tredegar, he was a steelworker and a schoolteacher before becoming a professor of creative writing at the University of Glamorgan. He lives in Brecon. His latest poetry collection Air Histories, was published in June 2013, and has since written a collection of six short fictions, titled Brief Lives, which was released in June 2018. £4. Everyone welcome. Croeso cynnes i bawb. Porthcawl-based charity, ‘Sustainable Wales’, is holding a Public Meeting at 7pm, MONDAY, NOVEMBER 19, at the Y Centre, John Street, Porthcawl, CF36 3AP, titled ‘The Regeneration of Porthcawl’. Chairs: Richard Thomas, Margaret Minhinnick. The purpose of the talk is to examine plans for the future of the resort, stressing the importance that regeneration is based on principles of sustainability. Brief questions from the floor are invited, and an informative occasion expected! FRIDAY, OCTOBER 26 at 8pm, charity, Sustainable Wales, hosts poet MARGOT FARRINGTON. Click to enlarge images in this post. Margot will give a reading of her work and sign copies of her books. These include Rising and Falling, Flares and Fathoms, and Scanning for Tigers. A short film will be screened that celebrates Tony’s life, which includes his work as a ‘light artist’. He is one of the first who, in the 1960s, initiated light-shows with rock groups, such as San Francisco’s Grateful Dead. A true pathfinder. TONY MARTIN arrived to San Francisco in 1962, promptly forging creative alliances and lifetime friendships with “new music” people Morton Subotnick, Pauline Oliveros, and Ramon Sender. When the San Francisco Tape Music Center moved to its location at 321 Divisadero St., Martin was invited by co-directors Sender and Subotnick to become the Visual Director. With special attention paid to working in the tape music medium, as well as performing regularly, they joined with Mills Center for Contemporary Music in ’67. 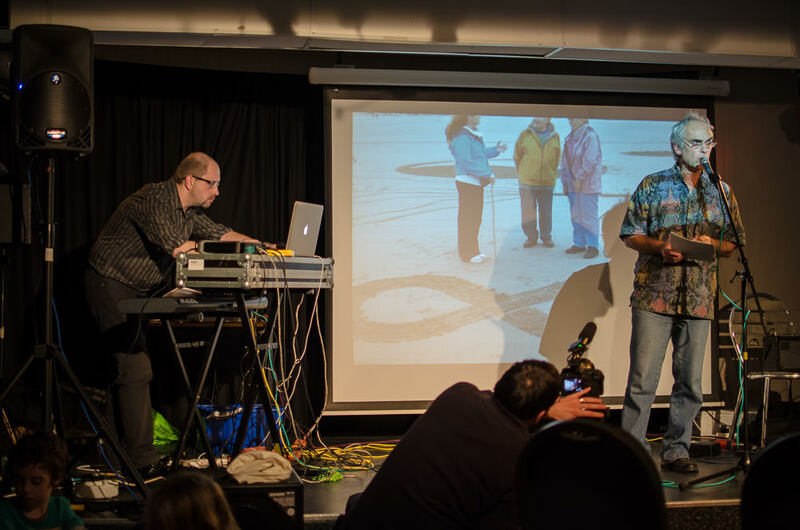 During the SFTMC days Martin was responsible for numerous visual compositions, including Terry Riley’s In C performance, as well as Sender’s Desert Ambulance. Martin was deeply engaged in experimenting with light via overhead and slide projectors, mixing paint, oil, water, and objects to build his light compositions. His following grew as a culture of psychedelia pervaded the 1960s and his light shows became popular amongst bands such as Jefferson Airplane and Grateful Dead. During this time he began to build "interactions" by engineering entire environments using sensors and mirrors. By the late ’60s he returned to New York City where he continued his focus for these types of installations; time and time again synthesizing his technological skills with painting as a moving image. A painter at heart, he continued to do so with consideration of his experience working with his viewer-activated sculptures, as well as his devotion to the medium of light — maintaining a thread that binds all aspects of his work. His latest piece entitled Proximity Switched Installation (2012) is a clear culmination of a lifetime of experimentation/production. A video demonstration of this installation will be available to view online at the time of the books release and includes musical accompaniment by Compound Eye (Spring Press). THE VARIABLE PLACE is the first book of its kind to tie together over 50 years of Tony Martin's work. It includes an in-depth interview with Martin by Will Cameron, Albert Herter and the editors. As well as a special introduction by long-time friend/collaborator Pauline Oliveros. Available as a limited edition release of 350, 104 pp, full-color, 8” x 10”, perfect bound. There will also be an Open Mike for local writers. “We’re delighted to be able to highlight the creativity of this extraordinary couple. Everyone welcome! Croeso cynnes i bawb. “A little satire will add to the fun”. After a summer break, Sustainable Wales’s ‘Green Room’ performance space recommences with a series of events. Friday, SEPTEMBER 28, at 8pm, we celebrate the Elvis festival in Porthcawl, with a welcome satirical look at ‘the King’. There will be Elvis Presley-themed films, and readings from Wales’s finest performance poet, Peter Finch. Peter will also be speaking about his recent book, ‘The Roots of Rock’ (Seren), in which Elvis, of course, is featured. Leading Cardiff academic, Dr Daniel Evans, will discuss the ‘class’ element of the Elvis festival. “The Elvis festival weekend is now well-established. 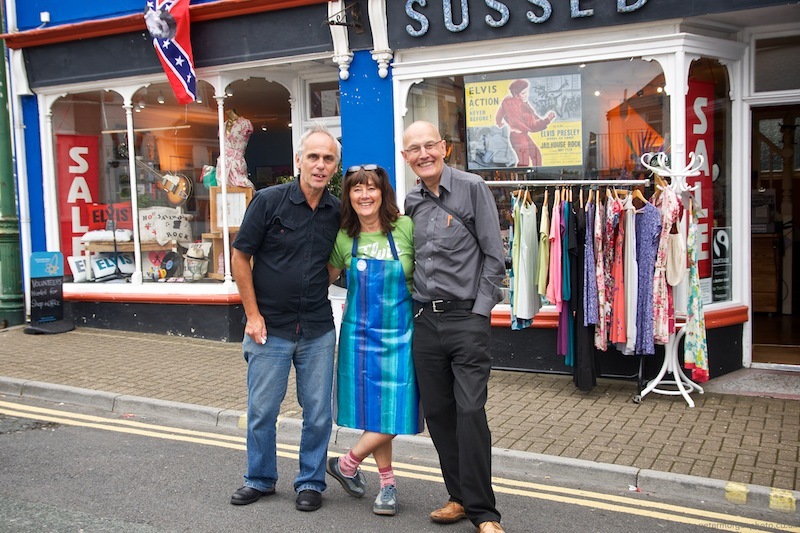 This extraordinary eisteddfod is unignorable in the town, so our charity is making a contribution to the fun. “Peter Finch will be sharp! And our popular Open Mike will include film and photographs, drawn from the history of Elvis in Porthcawl. Everyone welcome! Croeso cynnes i bawb! Two Exciting poets! Plus Open Mic. 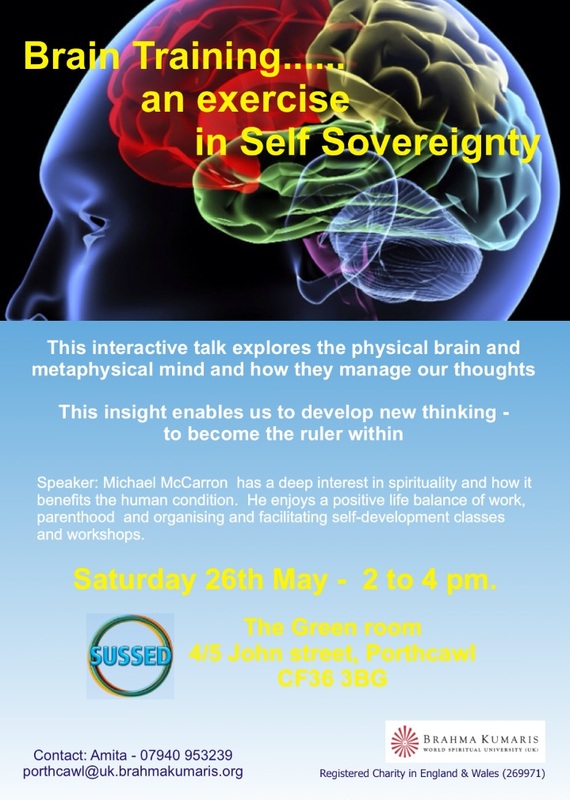 An Introduction to Raja Yoga Meditation www.brahmakumaris.uk Above SUSSED at the Green Room, James Street Porthcawl CF36 3BG. Next reader at Porthcawl’s ‘Green Room’ is poet and musician, Paul Henry, launching his new collection, The Glass Aisle. 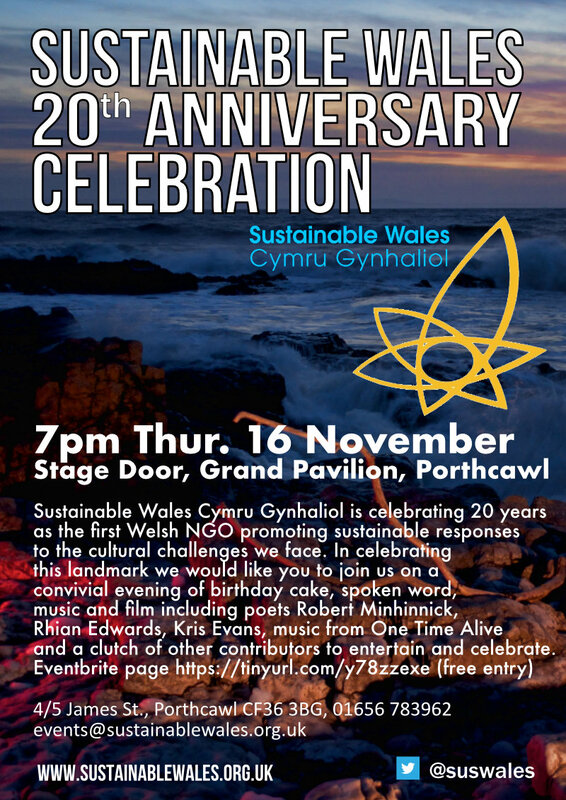 Sustainable Wales has been trying for two years to tempt Paul to Porthcawl, and we’re delighted he’s here. The book moves between rage and stillness, past and present, music and silence. It is Paul’s tenth book and will delight with its assured lyricism. Copies will be on sale on the night and in our shop, SUSSED. £4 entrance. Everyone welcome/Croeso cynnes i bawb. SUSSED's pop up fairtrade café at the Green Room returns on March 3rd 11am-4pm with a theme celebrating St David's Day! Dydd Gŵyl Dewi Hapus! The drama of the ‘Porthcawl hurricane’ to be relived at the ‘Green Room’. ‘Josephine’s Rain’ is a thirty minute evocation of a storm that damaged Porthcawl in 1995. Tropical storm ‘Josephine’ was close to hurricane status, sinking boats and destroying part of the seafront. The video performance promise a musical and poetic dramatisation of an incident in recent history. The original ‘Josephine’s Rain’ featured Robert Minhinnick, Peter Morgan and Richard Thomas. This new version is remixed by Peter Morgan, whose images will be shown during the performance. There will also be an Open Mic for readings and short films. Green Room Returns "Under the eaves of language"
An evening in English and Welsh to celebrate the publication of ‘Bondo’ by Menna Elfyn, from Bloodaxe. The title means ‘eaves’ in Welsh, referring to poetry and language as a ‘sanctuary’. Readers are Robert Minhinnick in English and Carys Evans in Welsh. Plus Open Mic. Everyone welcome. Croeso cynnes i bawb. Inaugural Meeting January 25th 7pm The Green Room, above SUSSED 4/5 James Street, Porthcawl CF36 3BG. All welcome. Artist Kevin Sinnott will be giving the third talk in the ‘Counterpoint’ series organised by Sustainable Wales, at 8pm on Friday, NOVEMBER 3, at 5 James St., Porthcawl CF36 3BG. Kevin will be talking about his career as an artist in Wales and London, and the creation of his new gallery in Pontycymer, his labour of love. Several of Kevin’s prints will be on view in this presentation, which is one of the celebrations for his seventieth birthday. Kevin will also have prints of two of his paintings which he will sign and these and his book ‘Behind The Canvas’ will be available from SUSSED. “The ‘Counterpoint’ talks have shown the range of interests for which the charity is known. “We believe in combining environmentalism with cultural matters, maintaining local diversity. For Kevin Sinnott entrance £4. “Are schools now exam factories? concern about the stress we are creating for our young. The Green Room pop up fairtrade Café returns this Sat., 21st October - with a selection of gorgeous home cooked fairtrade ingredient goodies and quality fairtrade hot drinks. Professor Allan Williams, the renowned ‘beachologist’, gives a lecture on ‘Marine Litter’, at Sustainable Wales’s Green Room 5, James St., Porthcawl CF36 3BG, 8pm, Friday, October 13. The talk is the first in an ambitious series of lectures, tiltled ‘Counterpoint’, organised to mark the charity’s twentieth anniversary. All types of beach litter will be discussed, including the degradation of plastic, ultimately to such fine particles it now enters the human bloodstream. Margaret Minhinnick for the charity said today: “Professor Williams’s talk is timely, as it has recently been revealed that Coca Cola produced an astonishing 110 BILLION plastic bottles in 2016, many of which will enter the sea. “Eight million tonnes of plastic enter our oceans every year. As Prince Charles says this week, ‘decisive action’ must be taken to protect marine wildlife." The ‘Counterpoint’ series of discussions reflect the environmental, social and cultural concerns of NGO, Sustainable Wales. 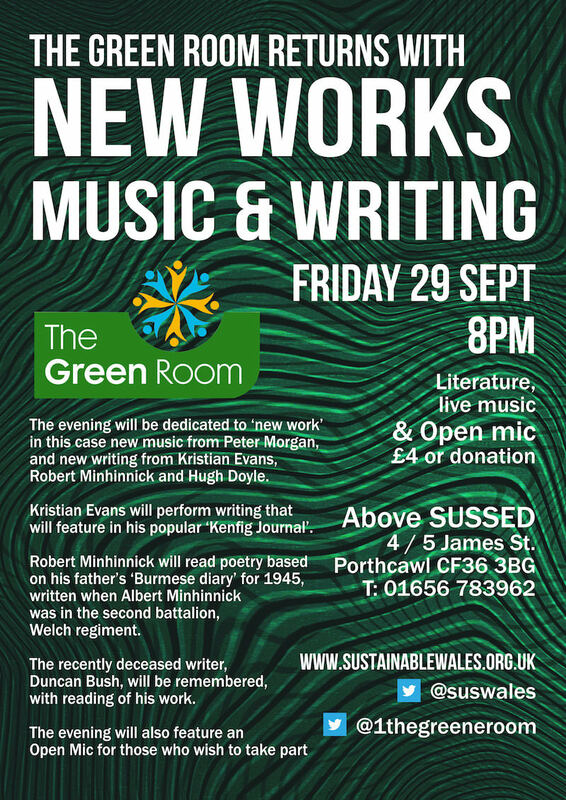 Sustainable Wales’s Green Room returns on Friday, September 29, 8pm. The evening will be dedicated to ‘new work’, in this case new music from Peter Morgan, and new writing from Kristian Evans, Robert Minhinnick and Hugh Doyle. 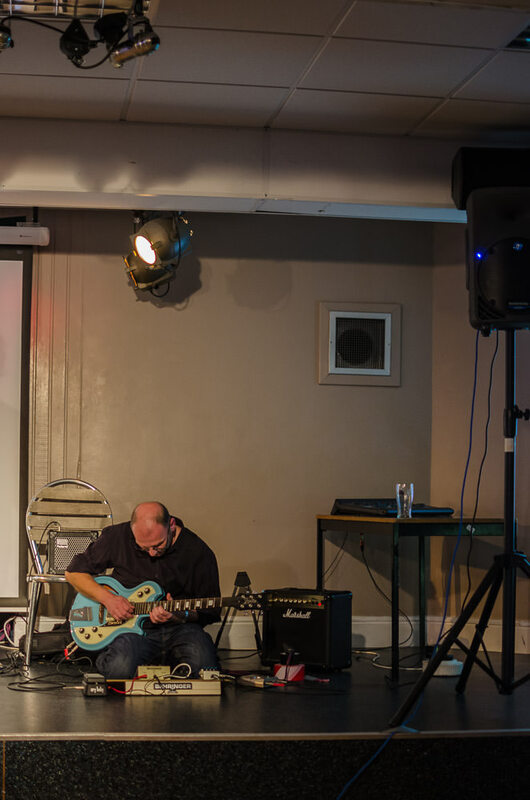 Kristian Evans will perform writing that will feature in his popular ‘Kenfig Journal’. Robert Minhinnick will read poetry based on his father’s ‘Burmese diary’ for 1945, written when Albert Minhinnick was in the second battalion, Welch regiment. The recently deceased writer, Duncan Bush, will be remembered, with reading of his work. The evening will also feature an Open Mic for those who wish to take part. After three months away, a healthy turnout is expected. 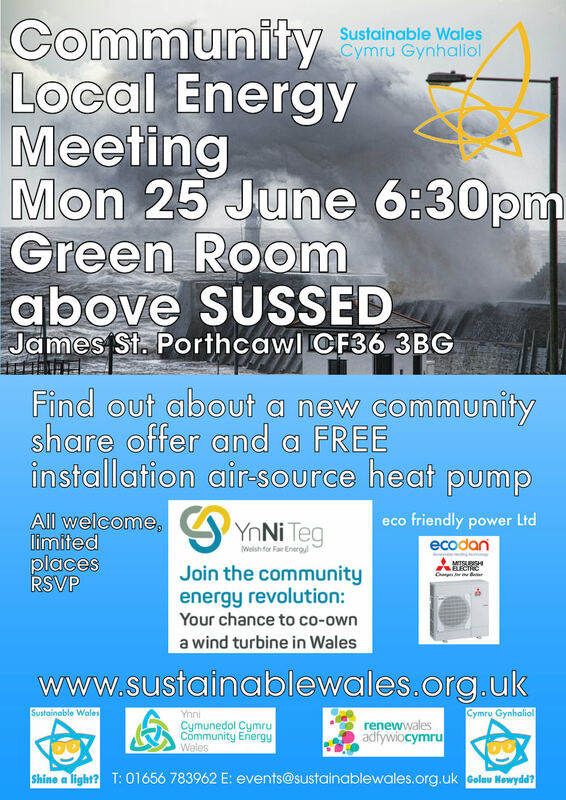 We have since discovered that quietly there has been a lot of activity regarding local energy in Bridgend and Sustainable Wales have agreed to draw attention to these projects and to host a workshop Bridgend’s Local Energy Revolution at the Green Room above SUSSED, Porthcawl. You can download here the event invitation and further details. Please RSVP and indicate language preference (Welsh / English), via email ( Geoffrey.hobbs@bridgend.gov.uk ) or phone (01656 643196) to ensure there is an appropriate amount of seating and refreshments available. The SUSSED Green Room pop up fair trade café returns on Saturday call in for some delicious home cooked food, plus fairtrade teas & coffees. Above SUSSED James St. Porthcawl just up from the Bandstand on John st.